Im back in the land of the normal and boring and ready to share my experience at Disneyland with you! 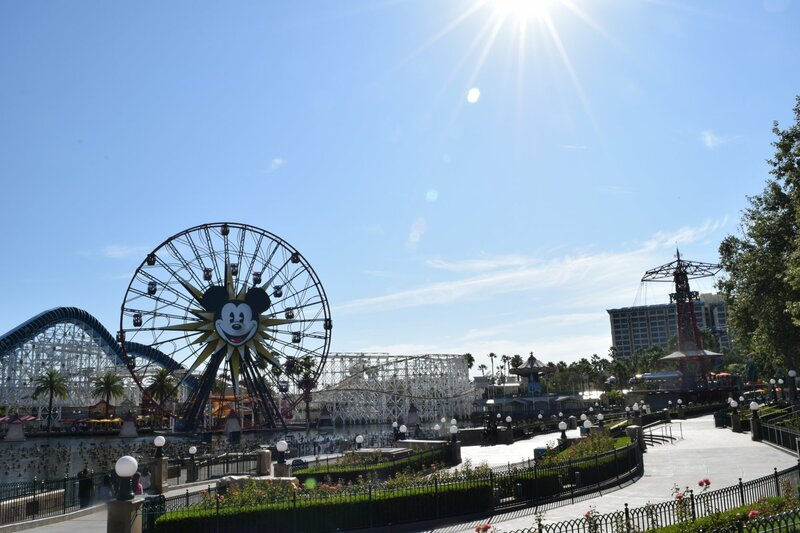 We arrived in Anaheim Wednesday morning and spent the first day at Disneyland and California Adventure. 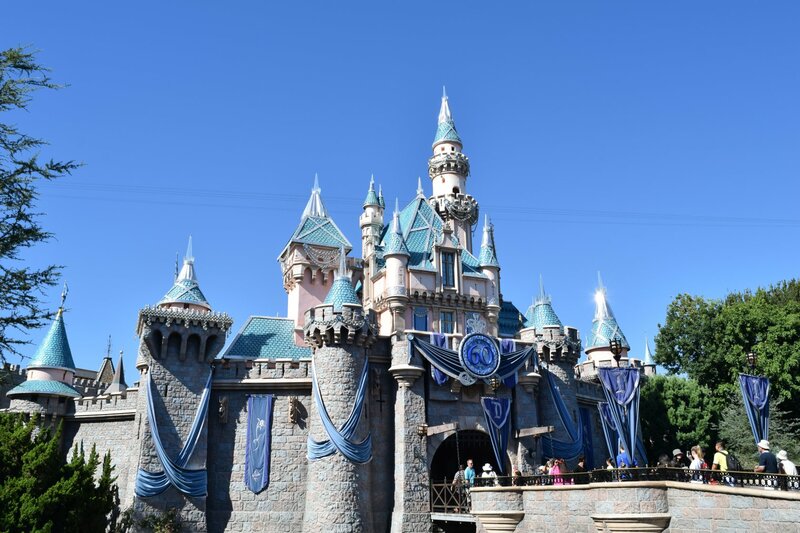 I was really excited to see Sleeping Beauty’s castle because its Disneyland’s diamond (60th) anniversary and I knew it was decked out with diamonds and sparkles. This baby did not disappoint! Our first stop was actually California Adventure, we wanted to ride the Cars ride before the line got crazy long. We really only had one day to do both parks so we had to get out butts in gear and go! We ended up riding in the single rider line because the regular line was 80 minutes but the single rider was only 10. Oh magic band how I miss you! Please come to Disneyland soon!! After the ride we were starving. Our flight left Houston at 5:30am, meaning we were up at 3:15am which is 1:15am PST. So far it was a long day and we needed more fuel!! I got my absolute favorite snack every. Mini churros and frozen apple drink. I love the Cozy Cone motel. Its so cute and themed and perfect. The lady who gave me the drink actually told me to be careful to pour slowly or the radiator might freeze. So cute. Joe got the super awesome oil can drink (filled with coke not oil) and a pulled pork cone. That pulled pork in a bread cone, portable and delicious! After we ate we were ready to leave California Adventure and head over to Disneyland. We did stop for a few photo ops though. More pictures of the castle, because obviously. 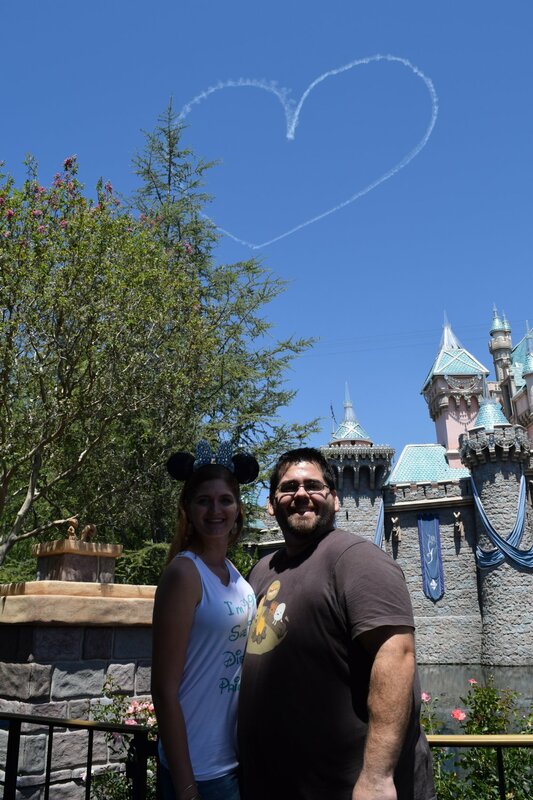 Gotta love sky writers and perfect timing!! After plenty of castle pictures, we rode almost all the rides. 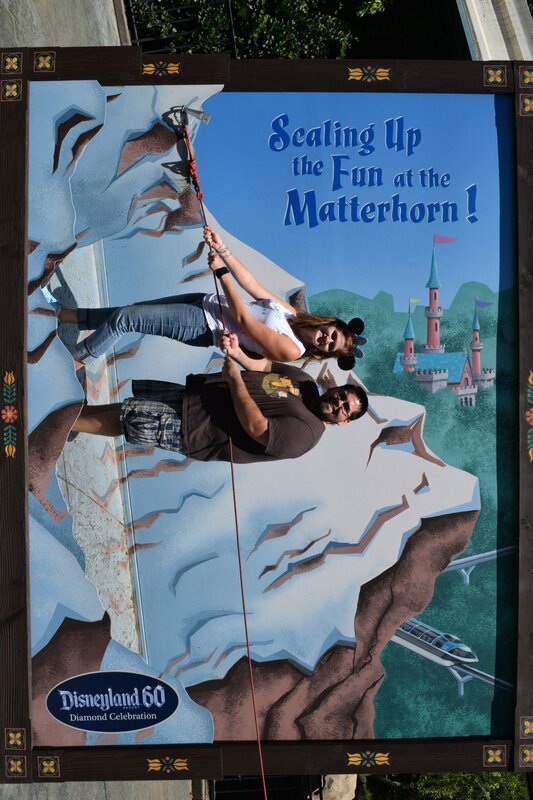 The Matterhorn totally screwed up my back but the photo op was really cute. I love/hate the entrance to Pirates of the Caribbean. Love because its a fun ride and how can you not get excited. Hate because the Disneyland Dream Suite sits on top of it and you have to see the sign every time you walk in. I will, I swear I will one day stay in the Dream Suite. Life goals people, they are real. Hungry again, but this time for macarons! 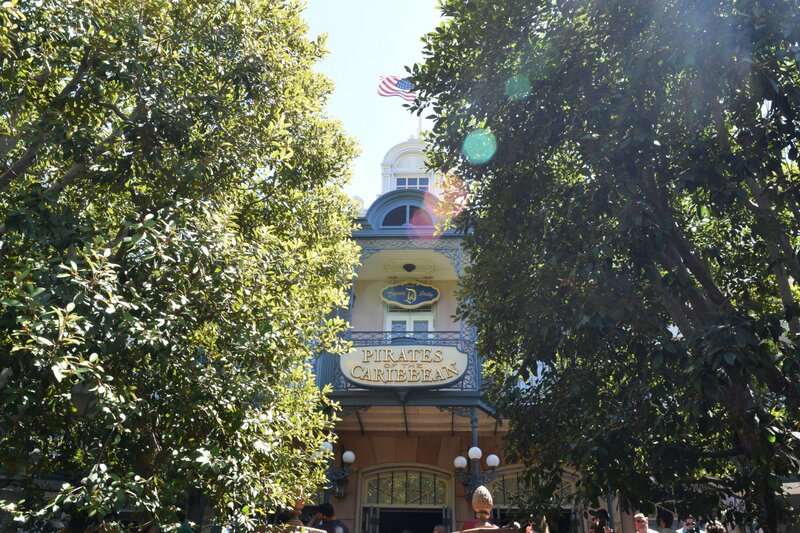 I see blog posts about the Jolly Holiday bakery but always forget to stop by (its in the same place as Crystal Palace at WDW and that place is unremarkable which is probably why I forget about it). I got both flavors of Macarons because why not! The raspberry was much better than the passion fruit but both were really good. 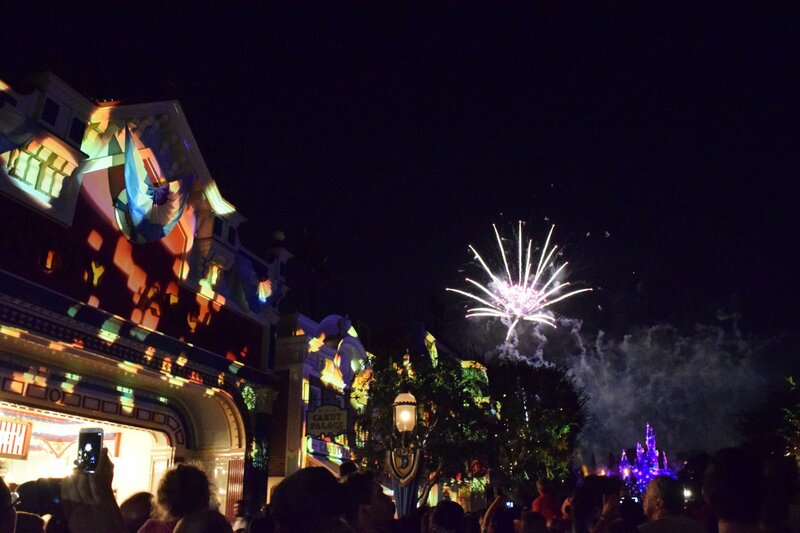 We stayed at Disneyland to see the nighttime parade and fireworks and they did not disappoint. I wont totally spoil it because you really need to see this in person if you can but below is one picture of the fireworks. If you get a chance make sure you stand in main street to get the full effect. CHIME IN!!! Which do you prefer Disneyland or Walt Disney World? AHHH I am so jealous. I am in dire need of a trip to Disney, it’s been almost a YEAR! Sorry to “cold contact” you… Your blog popped up on my google search. I am a dedicated Disney nametag collector… I probably have over 500, some dating back to the very first ones issued by Disneyland in the 1960’s. Alternatively, perhaps you have a friend or associate who also attended and who also received these nametags. Perhaps they would consider letting go of their nametags. More than one is even better, as I can use it to trade with another nametag collector I work with. Please let me know your thoughts, and please excuse the cold inquiry from an unknown person. hey keith, i do have name tag but want to keep it, sentimental you know. thanks for reaching out though.